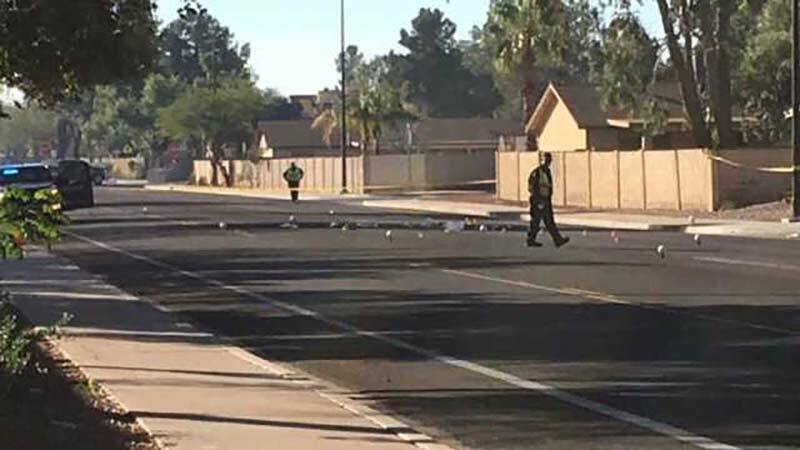 Gilbert, Arizona—Beth Kumpe, age 43, died of injuries she received when a pickup truck jumped a curb and struck her and her dog as they walked with Ms. Kumpe’s daughter on a sidewalk near Baseline and Gilbert Roads last Saturday. The driver fled the scene. Police located the vehicle about a half mile away and detained two people: Paul Flanigan, age 23 of Sun Lakes, Arizona, and his as-yet unidentified girlfriend. Accident investigators reportedly found signs indicating the truck had been involved in an accident, including the presence of animal fur. The dog suffered injuries. Investigators made no statements regarding whether Ms. Kumpe’s daughter was injured. Ms. Kumpe was taken to a nearly hospital in critical condition. Her family was later told all her brain activity had ceased. Mr. Flanigan’s girlfriend reportedly told police investigators that the couple was returning to the Valley from Sycamore Creek. She was sleeping when she was jarred awake by the impact. She allegedly stated they both had been drinking earlier in the day and that, following the crash, Mr. Flanigan stated, “I’m going to jail.” Flanigan is charged with manslaughter, endangerment and leaving scene of a fatal car accident. We extend our condolences to the family and friends of Ms. Kumpe over this tragic loss.